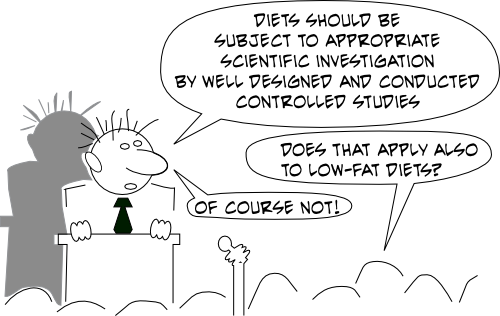 “Fad diets” are often promoted as a method of improving health, however they should be subject to appropriate scientific investigation by well designed and conducted, preferably randomised and, at least, controlled studies.” Caveman Fad diets article in NHS web. The hypocracy of this article is clearly lost on the NHS. From a prue scientific point of view the challenges the NHS raises with respect to this study are valid – if only they applied the same rigour to their own recommendations! !None of which have any basis in science. By way of example, there have only ever been 2 double blind randomised control trial investigating the effect of reducing saturate fat on heart disease. Nether found any effect. Other RCTs (although not double blind) have found similar results. I could go on – whether it is “base your diet on starchy foods, eat 5 a day. minimise intake of fatty foods. None of these have any support in robust science. Nowadays hundreds or thousands of those people know more about nutrition than the so called “experts”. They give you better information and cleverer analysis. You get better information from an anonymous commenter than from the UK National Health Services! Tom Naughton definitely had a point.